Why Muscle Torque Fitness St Albans? Muscle Torque Fitness is a new boutique St Albans gym providing affordable fitness for everybody. With increasing prices in the fitness industry, fitness has become a luxury too expensive for most. Muscle Torque Fitness in St Albans aims to ensure the community has access to a state of the art St Albans gym at affordable prices. Our dedicated staff will provide personalised service in our homely and cosy St Albans gym. Our goal is to make sure you are looking after your fitness, health and MUSCLES! If your muscles could torque, what would they say? 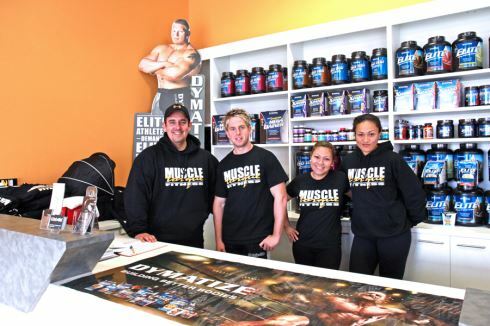 Muscle Torque Fitness gym in St Albans is a family owned and operated facility providing affordable services to the community. The St Albans gym is a complete one stop shop for fitness and is proud to provide first class service and facilities as well as experienced personal training. Come in and see what everyone in St Albans is talking about. A serious and friendly environment to get RESULTS! A training environment for everyone in St Albans. Strength training from beginners to advanced. Fully equipped gym in St Albans. We specialise in building MUSCLE! personal service from our St Alban personal trainers. The great range of health products from Dymatize. The new cardio theatre at Muscle Torque St Albans. A spacious and comfortable stretch area. We specialise in weight training. Complimentary breakfast for Muscle Torque members.